The highly-anticipated 37th edition of The Photography Show, presented by AIPAD, will be held March 30– April 2, 2017 at Pier 94 for the first time. The newly expanded Show, organized by the Association of International Photography Art Dealers, will present exceptional photography from early masters, modern luminaries, and rising and established contemporary names from more than 100 of the world’s leading fine art galleries. Lisa Sette Gallery is pleased to present a one-person exhibit at AIPAD with new installations by artist Charlotte Potter. The portrait as we know it is an image projected through glass. Human visages pass through a lens in the photographic act, then go forth again through glass, often as a miniature portrait illuminated on the screen of a digital device. These small, glowing identities are the obvious descendant of an ancient form of personal memento carved in glass or shell—the cameo. In Capturing Light: A History of Photographers and Cameographic, Charlotte Potter makes explicit the inextricable connections between glass and photography, as well as the applications of these media toward an essential and timeless form of aesthetic memory. Potter, a glass artist whose work frequently explores the performative and conceptual implications of her material, has often addressed the connections between glass, photography, and image presentation. 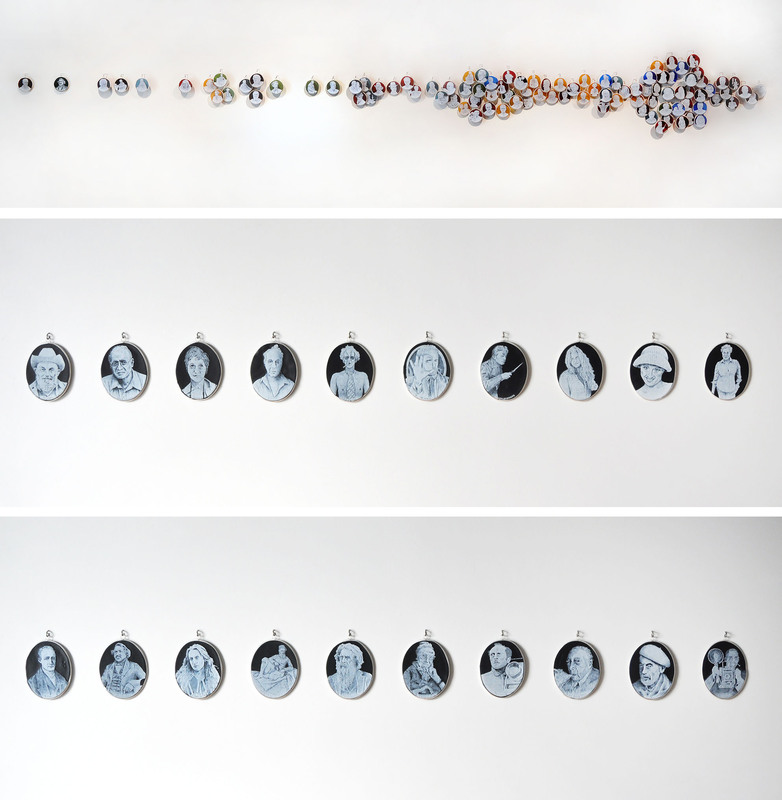 Previous installation works featured exploding patterns of cameo lockets that documented the social media profile as an expression of personal identity. Moving toward an investigation of photographic image-making itself, Capturing Light presents 100 influential photographers in a variation of a Venn diagram of cameo portraits. The resulting installation is a lyrical study of the history of photography, as artists who shaped the medium across a century assemble in a gathering of gemlike images, specific parts of a whole that is both delicate and voluminous. Quintessential first photographers Louis-Jacques Daguerre, Auguste and Louis Lumière, and William Henry Fox Talbot center the diagram; from there, Capturing Light radiates outward in three sets: Person, Place, and Thing. Sourced from the Internet and hand-engraved from glass treated with a digitally-developed light-sensitive decal, the cameos in Capturing Light and Cameographic are engaging, paradoxical objects whose existence owes to both ancient and contemporary technologies and desires. Capturing Light puts a human face to the iconic images of photography’s history; in a sense the camera is reversed. And Potter’s detailed attention to the process, materials, and history of photography exposes an interdependent system: glass and light and the human face are revealed as integral intermediary forms, the pervasive materials through which we remember one another.